From my original phone enquiry I felt assured that I was speaking with someone who really showed professional knowledge and listened carefully to my query. I was impressed that I could get the spot treatment to a tree trunk without the over-sell of other services not currently required or affordable. Yet I do feel confident to approach you for these in the future. Very happy with the customer service and extremely satisfied with the outcome. I will refer to my family and friends. Thank you again guys?? see you next year Really happy with your service. Everyone is easy to deal with. Thanks a lot for your help I am most grateful for the extra service provided by the company. Very professional in achieving good outcomes and customer satisfaction. Really happy with your service. Everyone is easy to deal with. Thanks a lot for your help No problems to report. See you again next year. I am most grateful for the extra service provided by the company. Very professional in achieving good outcomes and customer satisfaction. We engaged TPC to perform a termite inspection of our house, and Luke was fantastic and very thorough in the job he performed. Once complete he laid out all the options available to us, suggested the best approach and gave us a list of things that needed to be fixed. As we needed building and plumbing work performed, we were more than pleased to hear that TPC not only performed Termite protection, but Building, Plumbing and a range of other services as well. The building and plumbing work was done the next day, and our termite protection was done in two weeks. Very happy with the work, and would definitely recommend TPC to anyone needing household services. Can I just say, that the house has had two building inspections completed on it in the last two months with only a broken tile identified. You guys identified a number of issues which the seller has kindly rectified today. I am very happy with how thorough you guys were and the detail included in the report. I’ll definitely use you guys again and will be recommending your company to my friends. Thanks again for your help. Thanks for your services regarding my building and pest inspection at Willow Vale your company offers excellent service and Gary and Andre are extremely professional and efficient. So what stands out about TPC? I did not know you employed a wookie to help …. Good initiative though!TPC are punctual – or ring and keep customers informed about what is happening. Your reports are comprehensive. Your prices are fair. All pest control folk are friendly and helpful.Keep up the good work. May the pest removal force stay with you. 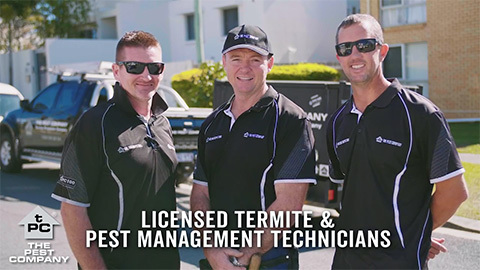 The Pest Company is run by proven experienced operators in the Pest & Termite industry since the year 2000. Our ongoing education & training never stops. TPC® conduct in-house training, utilise industry experts, product manufacturers and distributors who provide work shops that enhance our knowledge. Our performance is always marked against our never ending repeat customers who just keep using us year after year.